Top Gun. Because, you know, 1986. In all seriousness, this isn’t a very good movie. Take away the mildly entertaining plot execution and the spectacular flying sequences and you see a somewhat coherent story with mediocre to moderate acting and a once enjoyable soundtrack repeated way too many times for its own good. However, similar to Butch Cassidy and the Sundance Kid, it’s remembered fondly because in the end, it’s there to please us on an ephemeral level. If only the extra step had been taken to make it even more satisfying, I would have been much more likely to give a full recommendation. Pete Mitchell (TOM CRUISE), better known by his call sign “Maverick”, is a hotshot (the Zucker-Abrahams-Zucker parody of this was called Hot Shots) pilot who is called with his colleague “Goose” (ANTHONY EDWARDS) to attend the U.S. Navy’s Fighter Weapons School, an exclusive five-week program where the best Navy fighters are sent for more extensive training. 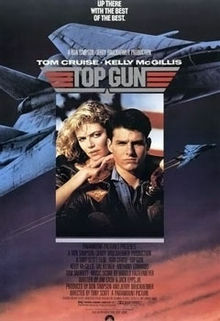 The group of pilots fight for the top spot, with Maverick’s most frequent opponent in that respect being “Iceman” Kasansky (VAL KILMER). Maverick’s a bit of an eccentric flyer – you wonder why a person like him would be a pilot in the heavily disciplined military. The answer is his father, also pilot whose plane was shot down during the Vietnam War, although Maverick never had accepted this story as truth. He never really knew his dad, and yet everything he does in the Navy as a fighter pilot is subtly underwritten by this preservation of respect. Supporting him through this competitive and dangerous environment is not only Goose, but a woman, Charlie (KELLY McGILLIS), whom Maverick meets at a bar one night. The next day he finds out she works as an instucter for the Fighter Weapons School (called Top Gun) with “top secret clearance” at the Pentagon. 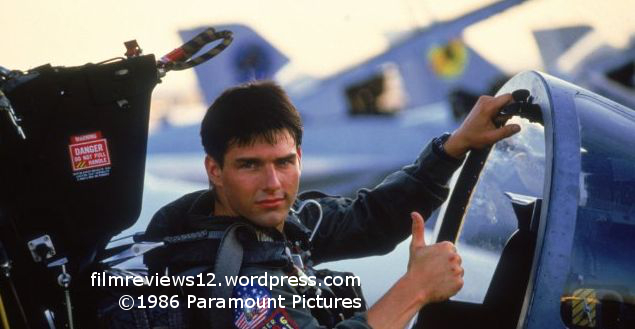 The script by Jim Cash and Jack Epps, Jr. is concerned with only a few things – giving Tom Cruise one-liners and charismatic opportunities, big aerial shows and shots of maneuvers, and the occasional explosion. While it’s commendable that this 109 minute movie never really loses steam, there’s an unavoidable feeling that a more interesting film with emotional payoff and hides behind an exceedingly basic background. When it comes to the question of whether it succeeds on those merits, the answer is yes. While some might argue that this should automatically require me to award Top Gun a higher rating, the star ratings are based on my overall recommendation of a movie, and I can’t with good conscience recommend a movie that has such a style over substance attitude. In a truly good movie, the latter should be primary to the former (I understand that co-producer Jerry Bruckheimer would disagree with me on this). As a movie that documents Tom Cruise’s rise to prominence, a highlight of the idyllic mid-1980s blockbuster, and a gung-ho American attitude of the time echoed in other idyllic mid-1980s blockbusters (i.e. Red Dawn, Rocky IV, although perhaps not as obvious on a direct level as the movies I’ve just mentioned), Top Gun also works. If you watch it, know that the moments of true feeling are not nonexistent, but few and far between.